Issue: Is Patient Self-Determination the Central Value in Making Medical Decisions? Philosopher Dan Brock and physician Steven Wartman explicate the concept of “shared decision-making,” in which decisions about the patient’s medical care are reached through collaboration between the patient and the physician. Physicians should sometimes provide guidance to patients, argue Brock and Wartman, but decisions depend fundamentally on the patient’s choices. British bioethicists Gordon Stirrat and Robin Gill, building on influential work by the moral philosopher Onora O’Neill, argue that the core moral value of medical decision-making is mutual trust in the covenantal relationship between patient and caregiver. Issue: May Surrogate Decision Makers Terminate Care for a Person in a Persistent Vegetative State? Jay Wolfson, a lawyer and the special guardian ad litem appointed for Theresa Marie Schiavo, explains the clinical and legal considerations that justified removal of Ms. Schiavo’s feeding tube, causing her to die. Tom Koch, an independent writer and researcher, holds that helping a person die cannot be said to benefit the person and that questions of personhood and sanctity of life gave reason to help her live. Issue: Is “Continuous Deep Sedation” a Valuable Treatment Option for Patients Who Are Close to Death? The American Medical Association affirms that in cases of extreme suffering the physician’s duty to relieve pain and suffering includes palliative sedation—using drugs that result in unconsciousness and may hasten death. Physicians Mohamed Rady and Joseph Verheijde argue that if sedation is used in conjunction with voluntary refusal of food and fluids to hasten death, then it is tantamount to assisted dying and may be bad for both the patient and the medical practitioner. Issue: Should Physicians Be Allowed to Assist in Patient Suicide? Issue: Should Embryos Produced During IVF Be Considered Children? In a friend-of-the-court brief submitted in a recent case in Missouri involving a dispute over embryos that a couple had put into storage, lawyers for the American Society for Reproductive Medicine argue that embryos are not persons and that treating them as such would have a profound negative effect on people who seek medical assistance in building their families. In a friend-of-the-court brief on the other side of the same case, lawyers representing several organizations that are opposed to abortion argue that science proves straightforwardly that embryos are persons, and that the embryos in the Missouri custody dispute should be given to the parent who seeks to take care of them. Issue: Should a Pregnant Woman Be Punished for Exposing Her Fetus to Risk? Liles Burke sets out the majority opinion of the Alabama Court of Criminal Appeals in a case involving a pregnant woman who was found to have used cocaine while pregnant. Burke argues that Alabama law that forbids adults from exposing children to controlled substances applies in cases involving pregnant women and their fetuses. Attorney Lynn M. Paltrow argues that treating drug-using pregnant women as criminals targets poor, African American women while ignoring other drug usage and fails to provide the resources to assist them in recovery. Issue: Should Physicians Be Allowed to Participate in Executions? David Waisel, a professor of medicine, argues that if the state is to administer capital punishment, then physicians may honorably seek to help the condemned die as painlessly as possible. Physician and journalist Atul Gawande supports capital punishment but believes physicians, as healers, should play no role in it. Issue: Should Pharmacists Be Allowed to Deny Prescriptions on Grounds of Conscience? Law student Donald W. Herbe asserts that pharmacists’ moral beliefs concerning abortion and emergency contraception are genuinely fundamental and deserve respect. He proposes that professional pharmaceutical organizations lead the way to recognizing a true right of conscience, which would eventually result in universal legislation protecting against all potential ramifications of choosing conscience. Julie Cantor, a lawyer, and Ken Baum, a physician and lawyer, reject an absolute right to object, as well as no right to object, to these prescriptions but assert that pharmacists who cannot or will not dispense a drug have a professional obligation to meet the needs of their customers by referring them elsewhere. Issue: Is the Use of Medical Tools to Enhance Human Beings Morally Troubling? The President’s Council on Bioethics, a presidential body formed by President Bush, argues that biotechnological interventions for making people better than normal raise profound concerns about the relationship between humans and nature, human identity, and human happiness. The libertarian science writer Ronald Bailey maintains that enhancements will only help people live better lives. Issue: Should Research on Human Embryonic Stem Cells Be Halted, Given the Presence of Possible Alternatives? The Bush Administration’s Domestic Policy Council argues that advances with adult stem cells and alternative sources of pluripotent stem cells make it unnecessary to conduct stem cell research that destroys human embryos, and that if the research is unnecessary, then it should not be done. Insoo Hyun, past chair of the Ethics and Public Policy Committee of the International Society for Stem Cell Research, argues that the alternatives present their own ethical questions and do not eliminate the need to conduct research on embryonic stem cells. Issue: Should Governments Develop DNA Databanks to Support Law Enforcement? David H. Kaye and Michael E. Smith, professors of law, argue that a population-wide DNA database could not only help solve crimes but would be fairer than more limited databases. Mark A. Rothstein, also a professor of law and a prominent advocate for maintaining genetic privacy, and his coauthor Meghan K. Talbott argue that DNA databases should be more limited in size and use. Issue: May Doctors Offer Medical Drugs and Surgery to Stop a Disabled Child from Maturing? Nurse Sarah E. Shannon believes that ethically and legally parents have the right and duty to make decisions and to care for their family members who are unable to do so themselves and that we should not abandon parents of severely developmentally disabled children to the harsh social and economic realities that are barriers to good care. Nurse Teresa A. Savage believes that children like Ashley should have independent advocates, preferably persons with disabilities, to weigh the risks and benefits of proposed interventions. Issue: Should Scientists Create Artificial Living Things? 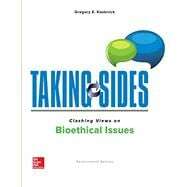 The President’s Commission for the Study of Bioethical Issues, a bioethics commission created by President Obama, calls for developing the field of synthetic biology, a branch of biological science that aims at genetically modifying organisms to carry out medical, industrial, and other tasks, with “prudent vigilance.” Friends of the Earth, International Center for Technology Assessment, and the ETC Group, leading a group of civil society organizations, counter by recommending a “precautionary” approach and calling for a moratorium on the release and commercial use of synthetic organisms. Issue: Could Conservation of Wild Species Be Improved through the Use of De-extinction Tools? Kent H. Redford, William Adams, and Georgina M. Mace, who are consultants and researchers working on issues of biodiversity and conservation, propose that synthetic biology, though it is often thought of as providing tool for intervening into nature, can be used as well to protect nature, by aiding in the restoration and protection of species and ecosystems. Christopher J. Preston, professor of philosophy at University of Montana, counters that biotechnological restoration of a species will cut deeply into environmental values. Issue: Does Government Overreach by Mandating Health Insurance? Philosopher James Stacey Taylor argues that the Affordable Care Act passed into law during President Obama’ first term is unduly paternalistic, failing to pass muster even on the simple utilitarian grounds that could most easily support policies to require citizens to buy insurance. Timothy Stoltzfus Jost, a legal scholar, holds that the ACA is intended to create a national community of community aid, relying on the power of Congress to impose taxes. Issue: Is There an Ethical Duty to Provide Health Care to Undocumented Immigrants? Rajeev Raghavan and Ricardo Nuila, physicians who work with end-stage renal disease patients, argue that standardized coverage for dialysis treatments would alleviate the burden on taxpayers where the most undocumented residents live and would improve these patients’ health, allowing them to return to work. David Stratas, a justice with the Federal Court of Appeals of Ontario, Canada, explains why Canada was justified in not providing health care benefits to an undocumented immigrant who lived in Toronto. Issue: Should New Drugs Be Given to Patients Outside Clinical Trials? Physician Emil J. Freireich believes that patients with advanced cancer and limited life expectancy should have the same privilege as all individuals in a free society. Law professor George J. Annas argues that there is no constitutional right to demand experimental interventions, and that fully open access would undermine the FDA’s ability to protect the public from unsafe drugs. Issue: Should Vaccination for HPV Be Mandated for Teenage Girls? Law professor R. Alta Charo argues that vaccination against the human papillomavirus, which causes most cases of cervical cancer, should be mandatory except in cases of medical, religious, or philosophical objection. Law professors Gail Javitt and Lawrence O. Gostin and physician Deena Berkowitz believe that, given the limited data and experience, and the fact that HPV does not pose imminent and significant risk to others, mandating HPV vaccine is premature. Issue: Should There Be a Market in Human Organs? Psychiatrist Sally Satel contends that a regulated and legal system of rewarding organ donors will not only save lives but also stop the illegal trafficking that offers no protections for poor people around the world. The Institute of Medicine Committee on Increasing Rates of Organ Donation argues that a free market in organs is problematic because in live organ donation, both buyers and sellers may not have complete or accurate information, and selling organs of dead people raises concerns about commodification of human bodies.